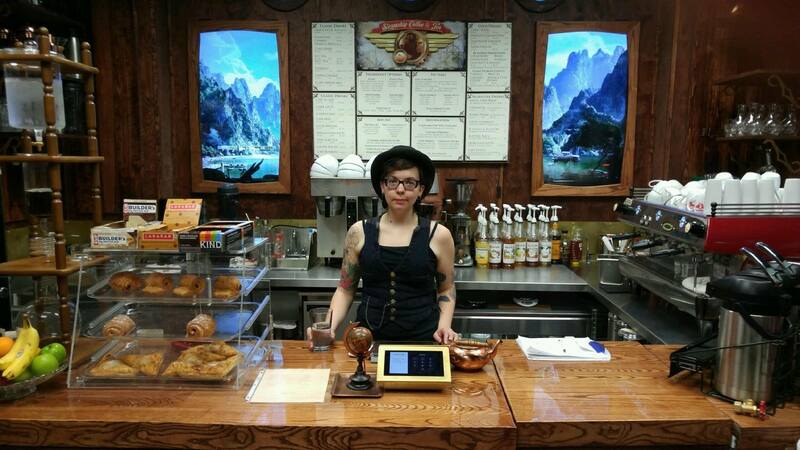 Steamship Coffee is your new favorite local steampunk coffee vendor. 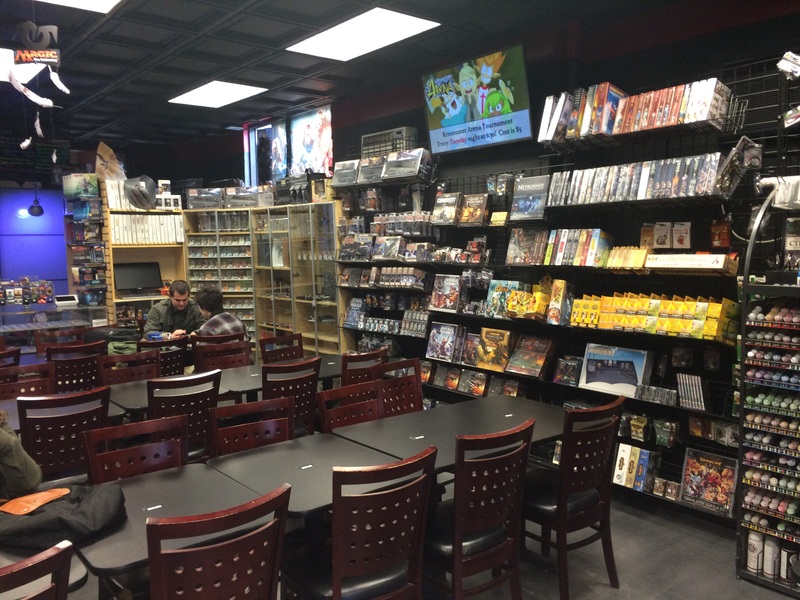 Located inside of Universe Games in Uptown, Steamship combines the loves of gaming and geekdom with quality caffeinated beverages. You don’t need to be a gamer to grab a cup of joe and you don’t even need to buy a beverage to enjoy the internet. (1G free to use!) The ultimate goal of Steamship Coffee is to build community and maximize use of this piece of prime Lyn-Lake real estate. Russo opened Universe Games about 10 years ago and he recalls how even back during the first CONvergence, folks were discussing the “holy grail” of having a coffee shop plus gaming venue. He reasons that it is a good marriage of topics, as you need space, tables, and chairs for your gamers, which coffee shops often have in abundance. Hippie capitalism is also at play, as having a coffee shop (or another source of revenue) within a gaming store helps to make the space self-sustaining—not necessarily profitable, but able to cover the rent in a high-rent neighborhood like Lyn-Lake. 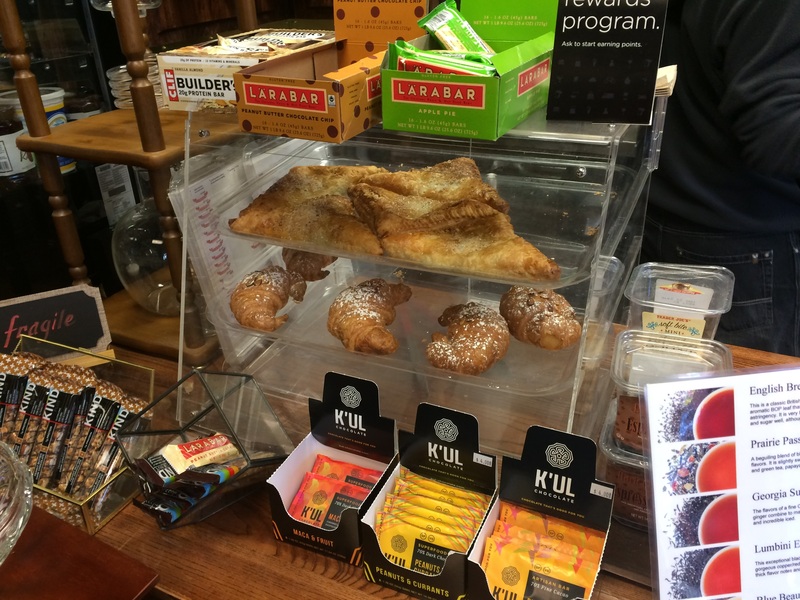 Steamship Coffee is deeply rooted within the local economy: UP Coffee and Bootstrap provide beans for non-espresso beverages, and fresh pastries are purchased from the Wedge each morning. One notable exception to this rule is the Italian-made La Marzocco espresso machine. Russo explains that all of the high-end coffee shops in the area (Spyhouse, French Meadow) have one, although the particular model at Steamship was purchased in and transported from South Carolina for a cool $20,000. The espresso for such a machine must necessarily be Italian, purchased from farmers in direct negotiation, to ensure the best quality preparation style. 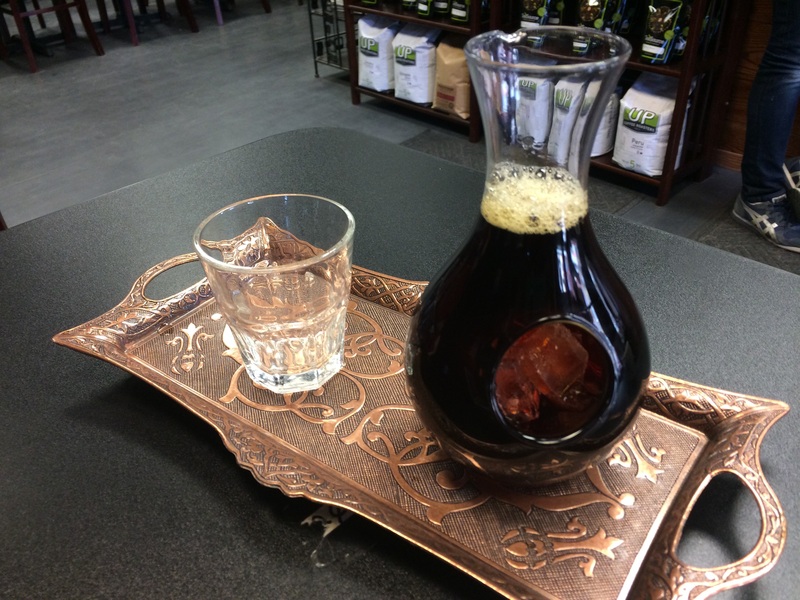 To differentiate itself from the many, many other local coffee shops in the area, Steamship offers several specialty beverages. One of these is the Kyoto drip brew, a special type of Japanese cold-press coffee. 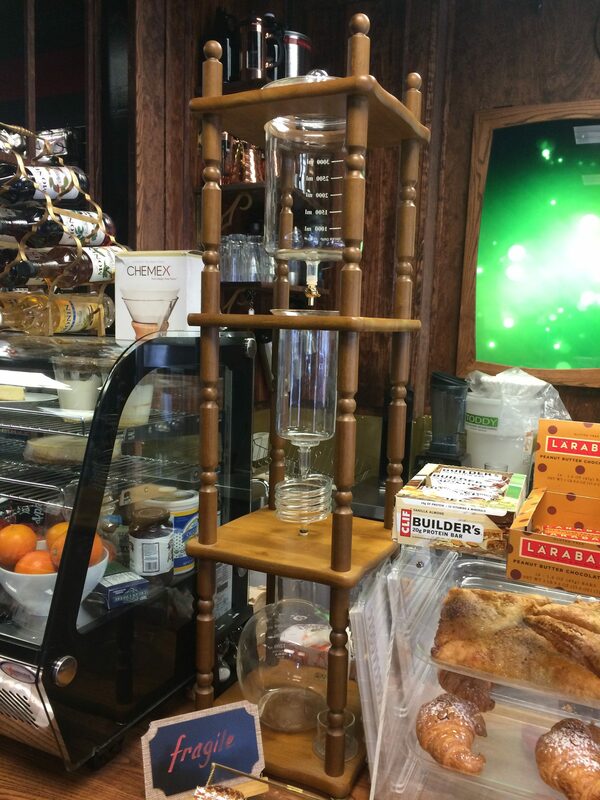 The contraption that prepares this brew (the Kyoto machine) appears far more scientific than the humble pour-over dripper—the container at the top dispenses ice-cold water, while coffee grounds go in the center and the spiral allows for mixing via gravity. The final product drips into the catch at the bottom, with a full batch taking about 12 hours to complete. This is a style of cold press that produces a very clean, extremely smooth coffee popular in Los Angeles and other West Coast cities. Russo notes that the experience of drinking Kyoto drip coffee is similar to sipping whiskey or scotch. This is not a beverage to gulp down hastily during the morning commute. At Steamship, Kyoto drip is served in a sake flask for an iceless presentation. (Ice cubes in the hollowed center of the flask keep the coffee cool.) My sample of the Kyoto drip was reminiscent of a rich porter—smooth, flavorful, and delicious. Another signature drink for Steamship is the Buttery Brew, aka bulletproof coffee. This drink is prepared with ghee, coconut oil, and coffee, all blended together for a creamy and sweet, highly energetic smoothie. Ghee and coconut oil provide energy to support and sustain the caffeine boost of the coffee shot, resulting in a caffeinated drink without a glycemic spike (unlike your average mocha latte). However, Russo is quick to note that the Buttery Brew is not a full meal because, while it may taste good, it is not particularly nutritious. At the end of our interview, I ask Russo what he thinks makes Steamship stand out from other coffee shops in the area. In other words, why should TCG readers come here for their caffeine fix? He cites the quality of the product (believe me, the Kyoto drip is delicious) and points again to the important opportunities the coffee shop space offers. “Purchasing here is buying a share of the experience because you interact in it.” Take that, Starbucks! You can find Steamship online at SteamshipCoffee.com or on the shop’s Facebook page. Nice read. I’m definitely going to make this place a have to see destination.